John Bridcut's film Jonas Kaufmann, Tenor for the Ages was broadcast on BBC Four (available on BBC iPlayer) on 15 October 2017 as part of the BBC Opera season. In this engaging 90 minute film we follow star tenor Jonas Kaufmann across two years of engagements and, thanks to a series of interviews with him, gain insight into his world and what it is like performing at the top level under such intense scrutiny. That the film has such fascination is partly due to serendipity, the engagements covered are Kaufmann's residency at the Barbican when he had just recovered from vocal problems, and then he went on to sing at the Last Night of the Proms and make his role debut as Otello in Verdi's Otello at Covent Garden (the production was broadcast on BBC Four the same evening and is also available on BBC iPlayer). It is Otello which bookends the programme, it forms the core of the narrative as the cameras follow Kaufmann backstage, front stage and in rehearsal. The basic style of the narrative is to move between these films of performance and backstage cinema verite style narrative, but intercut it with a series of interviews with Kaufmann as well as other talking heads, notably Sir Antonio Pappano (who seems to be cropping up rather a lot in this BBC opera season) as well as Kaufmann's accompanist Helmut Deutsch, and others with whom Kaufmann has worked. One fascinating talking heads sequence was audience members at the first of Kaufmann's Barbican concerts, with vox populi mixing with an uncredited Rupert Christiansen. Having heard Kaufmann interviewed on the radio a few times, I have always been impressed with how he comes over as open, engaging and thoughtful. The programme deals at one point with the various personae that a star must wear when working so much in the public eye, and we must beware of thinking that the Kaufmann who comes over in the interviews is any more the 'real' Jonas Kaufmann than other views of him. Still, he is willing to talk a lot about the mechanics and the methods of performing, as well as being candid about the vocal trouble he had (a burst blood vessel, not due to over-work but to high altitude). Yet it is clear from some of the backstage footage and from comments of his colleagues, that he is as demanding and as workaholic as the next performer. Pappano also comments at one point that Kaufmann needs to be constantly stimulated, but is clearly planning out his future debuts carefully There are a number of Wagner roles that Kaufmann has not yet sung on stage, and footage taken in Aldeburgh trailed the possibility of Peter Grimes, an intriguing prospect and one which would be viable, his English is certainly good enough judging by his idiomatic comments to the interviewer. What we saw, and what we didn't see, was interesting. Whilst we had rehearsal footage from the Barbican residency, we did not see anything of the live concerts he did manage to give (the song recital with Helmut Deutsch and the Wagner evening with Pappano conducting the London Symphony Orchestra). But we did hear part of the same repertoire, Wagner's Die Walkure from a concert given at the Royal Concertgebouw. Clearly there is a limit to the warts and all approach, and in fact there were few warts. This might have been relatively candid, but it was always respectful. A few sequences not in the opera house seemed more in the way of filler, and I am not quite sure what we gained from learning that Kaufmann is a keen football supporter. Perhaps we are meant to understand that he does not spend all his time on music. What the programme also did was give the view an insight into the complex nature of putting on opera and concerts at this high level. The film makers had a nice eye for incident, Kaufmann running back to his dressing room for his sword in Otello, receiving a gift of Union Jack boxer shorts for the Last Night of the Proms from Roderick Williams (the previous year's incumbent), the long discussion about different pianos for the Barbican recital and changing standing position because of squeaky floor-boards. An engaging and thoughtful film, we don't really get to understand what makes Jonas Kaufmann tick, but then can we ever do that with someone. The film is clearly aimed at those interested but perhaps not entirely knowledgeable yet has much to delight the seasoned operati as well. 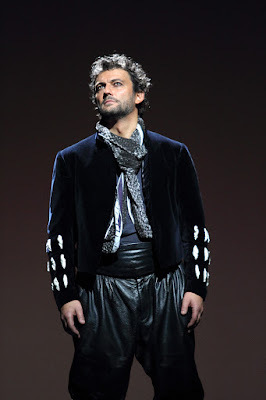 Jonas Kaufmann: Tenor for the Ages is available on BBC iPlayer for 30 days, the Royal Opera's new production of Verdi's Otello directed by Keith Warner and conducted by Antonio Pappano with Jonas Kaufmann in the title role is also on BBC iPlayer.